Who could ever forget playing System Shock 2? Who could forget the mindless, pipe wielding mutants patrolling dimly lit hallways. The ungodly sight of blood and bizarre biological growths covering walls and ceilings while a horrific symphony of terror created by computer terminals, whirring security cameras and the ship‘s relentlessly droning engines plays in the background. The cyborg midwives tending to their “little ones” while rattling off motherly stock phrases of affection. The exceedingly polite, if somewhat pushy and accident-prone protocol droids, or the partially vivisected monkeys rising up against their captors. The creeping feeling that the very environment you inhabit is your mortal enemy. How could anyone possibly forget playing – No, experiencing! – that? Whether the 1994 System Shock can be considered an RPG is up for debate. 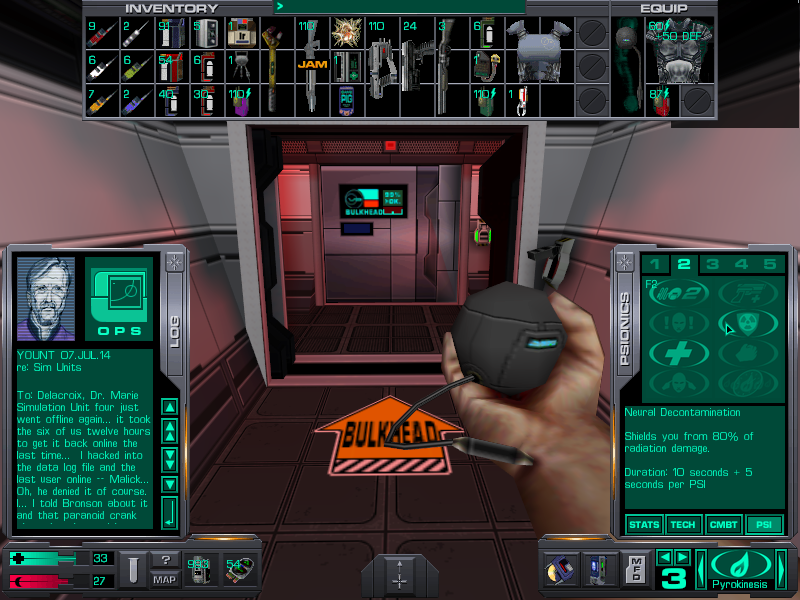 The fact remains that in an age where games like Doom limited its content to navigating mazes, finding keys and shooting stuff, System Shock featured a complex (if convoluted) UI that allowed the player to jump, crouch, peek around corners, jack into cyberspace, read logs and manage an extensive inventory. Sadly, in what would become a pattern for Looking Glass, releasing a product that was years ahead of its time didn‘t pay off. System Shock obtained wide critical acclaim, but sold poorly. However, the game managed to develop a cult following over the years. Among the select group of aficionados was a young Ken Levine. His company, Irrational Games, was granted the rights to work on a sequel, allowing for a proper, triumphant return of SHODAN, the devious rogue AI that had so masterfully served as the first game’s main adversary. Developed on a shoestring budget in an office that can be aptly described as Looking Glass’ broom closet, there was constant symbiosis between the two companies. 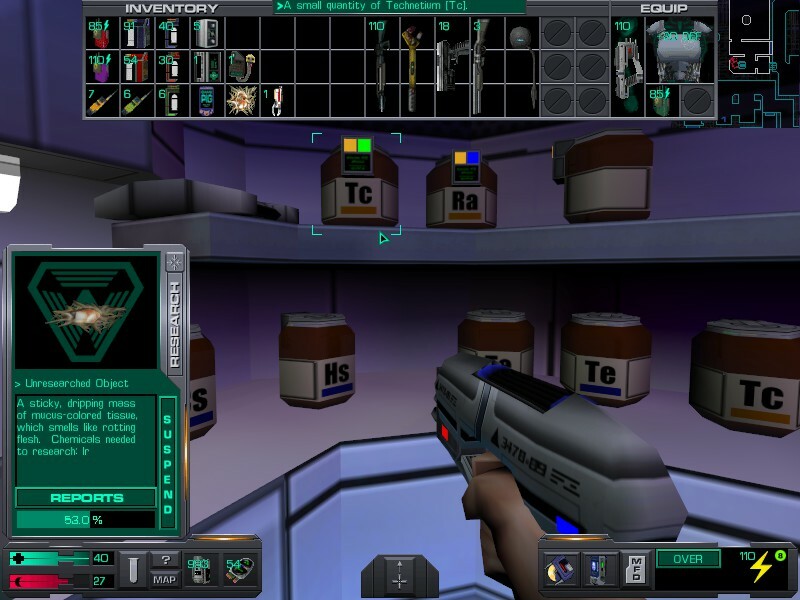 First and foremost, Irrational had access to the Dark Engine, which would first come to use in the 1998 stealth classic Thief. 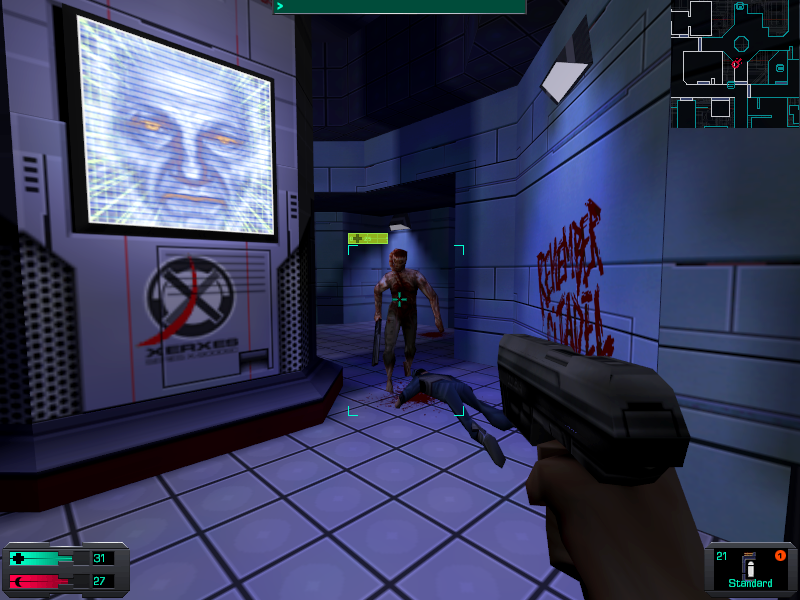 As a result, System Shock 2 shares many of its strengths with the original Thief: The player is able to hide in the shadows of the large, intricately designed levels, with different surfaces generating different levels of noise, potentially alerting nearby enemies. What truly separates SS2 from its predecessor is the use of a complex character system, resulting in a game that is both FPS and RPG in equal measure. Early on the player chooses one of three classes: the gun-toting marine, the psionically-endowed OSA agent or the techsawy navy hacker. Throughout the game the player can customize his character however he chooses: improving his attributes, selecting traits, training the skills required to equip and repair more powerful items, finding implants or learning any of the 35 available PSI-powers, that range from temporarily buffing stats to firing mental projectiles and even the ability to teleport yourself. Resources are scarce though: weapons degrade with every single shot and have a nasty tendency to either break or jam during tense firefights. Enemies respawn over time, and even areas which have been previously cleared can become death traps. The high difficulty crowns SS2’s unrivaled sense of danger. To add to the atmosphere, the ghosts of the Von Braun – the faster-than-light spaceship where your descent into hell takes place – still inhabit the vessel. Both figuratively – in the form of increasingly desperate audio logs – and literally, as apparitions that recreate the crew members’ final, ghastly moments. System Shock 2 struck a nerve, but despite an overwhelmingly positive reception and the fact that it would go on to inspire both FPS/RPG hybrids and horror games to this very day, it sold below expectations. And with Looking Glass going out of business in 2000, the jarring cliffhanger that concludes the rushed final levels remains unresolved to this day. Irrational Games would live on to see the financial success that Looking Glass was never allowed with the 2007 release of the popular Bioshock series, which – to the disappointment of many fans – did not turn out to be the next step in the logical evolution of FPS/RPG hybrids they had hoped for.